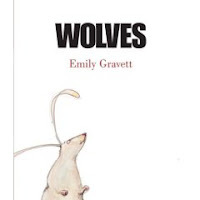 Wolves by Emily Gravett. Library copy. The Plot: Rabbit gets a book on wolves out of the library. He's so captivated by the book and involved in the reading that he doesn't notice it when the wolves leave the book. The Good: Because I like picture books a little bit twisted, this quickly earned a place on my Best Books list. Even tho this book falls under the "holy Hannah it's brilliant, but who will I read it to?" dilemma. The book rabbit is reading is the book you are holding in your hands. Examine the endpages, look at the cover under the dustjacket: yep, you're reading rabbit's book. And if you're reading rabbit's book, and you know how that story ends . . . I also have a wee bit of a spoiler dilemma because part of my initial joy was a "did they just do that?" reaction. Yeppers, spoilers, skip it if you don't want to know. As rabbit reads the book, the reader notices the wolf leaving the book. And eyeing the rabbit. Just when we learn that one thing that wolves like to eat is . . . rabbits. Next we see a scratched up book jacket that does not bode well for the rabbit. And one of the last pages shows rabbit's mail, clearly neglected, letting you know -- yes, the wolf ate the rabbit. But for those of you who want happy endings, well, we have an alternate ending! And it's impossible to read without hearing it said in a silly, we all know this is impossible but let's pretend, shall we? voice, that says that this wolf was a vegetarian and he and the rabbit sat down and ate jam sandwiches. Part of the fun of this ending? It's clearly created from ripped up pages of the book; clearly made up. It's like Stephen King or the X Files for kiddies. Cheetah will LOVE this. When you're looking for a story to read to older kids -- those too old for picture books, but you need something that will be short, hold their attention, and create a bit of respect, humor them, let them know that you know that they aren't little kids -- pick this one. And at least the teacher will giggle at the end note: "The author would like to point out that no rabbits were eaten during the making of this book. It is a work of fiction." My favorite picture books are the ones that are quirky, or different, or twisted; or that require the reader bring something to the book. This hits all those spots; so a Best Books of 2006. An interview at Pan Macmillan. A Fuse #8 Production review. I finally got a chance to read this book last week, and it's hilarious - I love that it has an alternate ending! If not for that, I would have been quite upset with it as a kid!